As a young business woman who has hope for the future, I’m here to tell you that there’s only one congressional candidate in this election who will truly fight for everyone, and that’s Justin Fareed. Justin’s opponent, Salud Carbajal, likes to make things up in order to distract people from his ignorance and lack of depth, but we’re not stupid, and our community won’t fall for it. 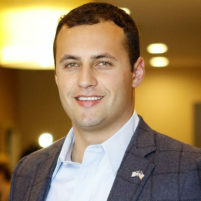 Everything Justin Fareed stands for will strengthen the rights of women in all regards, from his support of a competitive healthcare system that will protect patients with pre-existing conditions to his dedication to individual liberties. I wouldn’t be supporting Justin if half of the lies Salud is telling were true. At the end of the day, the only thing Salud’s pathetic ads show is his insecurity in this election, and I’m proud to say I live in a community that’s too smart to fall for his political games. Salud wouldn’t know where Justin stands on the issues, because he’s too afraid to show up to forums. Maybe if Salud would debate Justin, he could get his facts straight. Maci Umbertis is a businesswoman who lives Paso Robles. Yes, we can count on JF to protect individual liberties, such as a women’s right to choose. Mamas boy won’t protect us from anything. I got my call from the pollster who wanted to know if, among other things, I thought Justin Fareed shared Donald Trump’s views on women. Next time I’ll hang up immediately.